SEATTLE — Metal-organic framework (MOF) is a highly porous molecular powder that absorbs water. The internal surface is comprised of microscopic pores and micro-channels that expand the entire water-absorbing area. In October 2017, scientists tested a prototype water harvester using a metal-organic framework to extract and retain the maximum amount of humidity in the air and convert it into drinking water. MOF inventor, Omar Yaghi, built the harvester so that it can function at ambient temperature with ambient sunlight and without an additional energy source. The prototype used MOF-801 that has an internal zirconium surface. It was tested in the Arizona desert where the relative humidity drops from 40 percent at night to 8 percent during the day. The test demonstrated that researchers could easily increase absorption by adding more MOF-801. However, MOF-801 is very expensive, so Yaghi created a cheap alternative: MOF-303 technology. Zirconium, the basis for MOF-801, costs $160, while MOF-303 costs only $3. Not only is it 150 times cheaper, but MOF-303 is lighter and captures twice the amount of water. It is also more environmentally friendly because the synthesis runs in water, not organic solvents like other water harvesting devices. The water harvesting cycle (WHC) begins at night when unsaturated MOF is saturated during exposure to desert air. Captured water is released from the saturated metal-organic framework when it is exposed to sunlight. Collecting occurs during the day when the released water vapor humidifies the air surrounding the MOF. Ambient cooling results in condensation. This process continues until the end of the day when the liquid water is collected and the next WHC begins. The total amount of water collected depends on the level of MOF saturation. MOF-303 technology was developed under laboratory conditions that mimicked those of the MOF-801 desert experiment. Rigorous lab testing that monitored fluctuation and stability proved MOF-303’s ability to last for years. Yaghi believes the blueprint for MOF-303 technology is suitable for use in any desert climate around the world. As long as there are solar plots, humidity levels and temperature difference, the same metal-organic framework can be used, only the box’s configuration will change. However, in spite of its adaptability, Yaghi and his team still need to develop a filter for the aluminum-based device to combat dust storms. In late summer of 2018, researchers took MOF-303 out into the field. They tested it in Death Valley where humidity never exceeds 25 percent, but the results have not yet been published. Nevertheless, MOF-303’s low cost is making large-scale water harvesting a possibility. Berkeley News reported that a few startups are developing commercial water-harvesting devices. According to the IBSA Foundation for Scientific Research, international research institutes and companies are developing this type of equipment in response to the growing water shortage and extreme changes in climate. Additionally, Omar Yaghi is collaborating with Prince Dr. Turki Saud Mohammed Al Saud, president of King Abdulaziz City for Science and Technology in Saudi Arabia. They are working together on MOF-303 technology for their joint research Center of Excellence for Nanomaterials and Clean Energy. 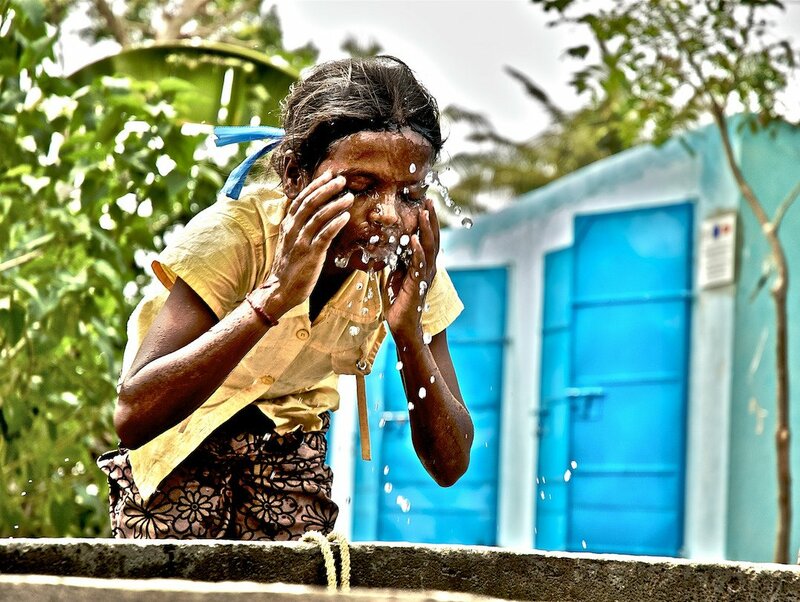 Lack of access to safe water and sanitation affect countless people worldwide. According to water.org, one in nine people do not have access to clean water and one in three people have no access to a toilet. Women are disproportionately affected by this crisis because they are usually responsible for retrieving water. This time-consuming task takes them away from work, school and caring for their families. Water.org also reported that poor access to safe water and sanitation kills one million people around the world each year. This crisis is responsible for the spread of infectious diseases, physical injury from carrying large amounts of water, high child and maternal mortality rates and high risk of sexual violence for females traveling to remote areas for water. Children, too, bear the responsibility of collecting water for their families and, as a result, they are taken away from school and play. Additionally, the hours spent collecting clean water or finding safe sanitation are responsible for billions of dollars in lost economic opportunities. MOF-303 makes possible water harvesting in extremely arid, rural areas around the world, areas where other water harvesting techniques cannot operate. Commercialization can deliver this life-saving technological advancement to the places that need it most. Whether in the Middle East, the Mediterranean or the Sahara, aluminum-based MOF can reduce the number of water-crisis-related deaths and injuries. Although there still is work to be done for safe sanitation, innovators like Omar Yaghi give us hope with his vision of “personalized water.” Yaghi wants to have water off-grid one day, where a device at people’s homes running on ambient solar can deliver water to satisfy their household needs. Until then, the current MOF-303 technology is the answer to providing clean water and proper hygiene.